The title Long Yin (Dragon Intonation) can be found on some ancient melody lists such as that with You Lan, but there is no reason to think there is any melodic connection between that and the present melody, which can be dated back only to 16th century handbooks.6 This is particularly true in that the earliest of the surviving versions has the title Auspicious Dragon Intonation (Rui Long Yin), the literary references to that being a ci pattern associated with love poetry. In addition, after several occurrences of Shui Long Yin (Water Dragon Intonation), this melody later was more commonly called Canghai Long Yin (Dragon Intoning on the Sea) or Cangjiang Yeyu (Night Rain on a River). None of the titles other than Shui Long Yin seems to appear in any of the old qin melody lists. Rui Long Yin survives in only the 1579 handbook. Shuilong Yin tablature survives in 11 handbooks (four with lyrics) from 1589 to 1751, while for Canghai Long Yin there is tablature in 23 handbooks (none with lyrics) from 1609 to 1910 (see appendix 7 and note the recording). All are musically related except for the two Shuilong Yin that use ci lyrics, 1682 and 1687. The title "Shuilong Yin" is better known as a pattern within ci poetry.13 The tablature would have to be changed in order to make the lyrics with this pattern fit the present melody according to the normal pairing method. However, the lyrics accompanying the tablature for the unrelated melodies of this title in the 1682 and 1687 handbooks do follow one version of this Shuilong Yin pattern. "Shuilong Yin" is also quite well known as a qupai: a melody within northern opera, particularly one featuring the suona reed aerophone.14 Perhaps related to this the same title also appears in the repertoire of some wind and percussion ensembles. In this regard one should note that the wailing nature of some sections of the qin melody may be intended to evoke this. The preface to this earliest surviving tablature connects the melody to a name associated with the famous Song dynasty handbook Zixiadong Pu. This suggests that the melody was being revived from old tablature. Unfortuately, there is no direct evidence to support this claim. As suggested above, all but two of the melodies discussed here are related. The four Shuilong Yin having six sections are all quite similar; the two having four sections are quite different, as are the two in three sections with lyrics; the one in two sections is in gong mode, but still seems musically related. As for the versions called Canghai Long Yin, although they are clearly related to Shuilong Yin, they are more closely related to each other. One interesting aspect of the connection is the fact that the earliest version of Shuilong Yin has a comment at the beginning of its last section that seems to suggest that here one should play again music from the previous three sections (see quote). The tablature for Canghai Long Yin seems to write out just that. In sum, the early variety for Shuilong Yin and the continued publication of versions of the melody under the other titles suggests that this melody and its theme were quite popular in the late Ming dynasty and throughout the Qing. According to Zixiadong (Zixiadong Pu?) study, Kongming created it. It is said, 'The dragon is a yang being. At the beginning of the Yi Jing it is lying low.' Nowadays a dragon makes sweet dew (manna) as it returns to the deep sea, for a moment its humming sound flows along, its significance vast and broad, having the sound of the nine heavens." 17458.780 and 5/887 水龍 shuilong: water dragon, dragon in water, prehistorical rank, warship, old fire-fighting device, herbaceous plant (Jussieua repens? ), etc. In Chinese astrology a water dragon is a person born in a water and dragon year (one of every 60 years, most recently 21 January 1952 to 13 February 1953). See also "submerged dragon" below. 17458.781 and 5/887 水龍吟 Shui Long Yin: 詞牌 ci lyrics pattern and 曲牌 qupai, a tune in northern opera. The Shuilong Yin lyrics in the handbooks dated 1682 and 1687 seem to follow one form of the Shui Long ci pattern. For more on the ci pattern see below. "Water Dragon" also has a potential connection to tea in that there are "水龍茶杯 water dragon tea cups". Note also that in fengshui the term is used to describe a type of man-made water course. For further information on yu mode see Shenpin Yu Yi and Modality in Early Ming Qin Tablature. 32424.29 蒼海 Canghai (same as 滄海). Although none of the melody commentaries connects Canghai Long Yin with Shuilong Yin, a direct lexical connection can be seen in the illustration. In addition, even a casual examination of melodies under the two entries shows that they are versions of the same melody. Zha Guide 30/234/-- said only that Canghai Long Yin is also called 滄江夜雨 or 蒼江夜雨 Cangjiang Yeyu; it then lists the melody in 23 handbooks to 1910 (in comparison, Shuilong Yin is listed in 11 handbooks [four with lyrics] from 1589 to 1751). The 1609 Qinpu Zhengchuan is the only handbook to include both Shuilong Yin and Canghai Long Yin; here Shuilong Yin is a 琴歌 qin song. Furthermore, no commentary seems to discuss the relationship between the two, the former never mentioning the latter, the latter saying only that Canghai Long Yin and Cangjiang Yeyu are the same, with no mention of Shuilong Yin. The earliest direct attribution in any of the various Canghai/Cangjiang prefaces seems to be the one in Qinxue Chujin (1894) attributing it to Zhuge Liang. In fact, Taiyin Xisheng (1625, IX/109) had a comment attributing Cangjiang Yeyu to Li Shuinan, but it does not include the tablature. Guqin Quji I/211 has a transcription of a recording by Le Ying based on the 1820 tablature. Hsu Wen-Ying says Wuzhizhai Qinpu (1722) attributes Cangjiang Yeyu to Zhuge Liang, but as yet I have found this attribution only in Qinxue Chujin (1894), which calls it Canghai Long Yin, "also called Cangjiang Yeyu". This illustration is from the edition of Xinkan Taiyin Daquanji reprinted in Qin Fu (QF/64); note that in the Taiyin Daquanji reprinted in QQJC, I/61, the title is In the manner of a sea dragon intoning (滄海龍吟勢 canghai long yin shi). Both images illustrate qin finger techniques called 小間勾 xiao jian gou and 大間勾 da jian gou; these are old techniques that do not actually appear in this melody. This is sometimes translated as "Dragon's Hum" or "Dragon's Moan", in particular when it is the name of a qin (e.g., at the Freer). As a melody title it can be found in the You Lan list, but seems to be used as a title for the present melody only in 1812. See Appendix. Zha Guide 26/218/419 includes 11 handbooks with the title Shuilong Yin and 30/234/-- includes 23 with the title Canghai Long Yin or Cangjiang Yeyu. Only one handbook (1609) has versions of both. "Evaluate himself" is "自況 zi kuang". A note under the title "Section 1" adds "謫僊子即李白 the immortal banished to earth was Li Bai"; the preface also mentions praise of the qin in a Shuilong ci. There are actually two sets of lyrics for Shuilong Yin. The others, following the ci pattern, given below, could of course be replaced by others in the same pattern (example. 11. See, for example, the interpretation of the first Yi Jing hexagram, mentioned below. This ci pattern also has other names such as Small Building Connected to a Garden (小樓連苑 Xiaolou Lian Yuan) and 龍吟曲 Longyin Qu. It is defined as 雙調一百零二字，仄韻 double verse of 102 characters each, ze rhyme. 17458.781 has 填詞名解 (5458.37xxx) saying it is 越調曲也，取名於李白詩，笛奏龍吟水 a yuediao melody that takes its name from a Li Bai poem, Di Flute plays Longyin Shui" - see comment above with the 1609 preface. In both cases the second verse repeats the pattern of the first except in the final line. As here the second verse seems often to have 100 instead of 102 characters. It also comes in a number of variations. Thus, in addition to the original 5.5.3.3. there is the present 5.4.4 as well as 3.6.4, 9.4, 7.3.3 and others. Another name for Shuilong Yin when used as a 曲牌 qupai is 打開門 Da Kaimen: Great Door Opening; it is purely instrumental and generally features the 鎖哪 suona reed aerophone. It is said to be 北曲入越角隻曲 (see 4.432 七調). Some examples of wind and percussion recordings entitled Shuilong Yin can be found through an internet search. Regarding the Yi Jing reference in the preface, the text with the book's first hexagram (called "乾 qian": "initiating") begins, "乾﹕元、亨、利、真。初九，潛龍勿用。" Here, after giving four attributes of qian, it says of the first gram (bottom line): "潛龍勿用 the qian long (submerged dragon) is not ready for use". This line has been interpreted as, "When the times are not right, the dragon should lie low or submerge in water". 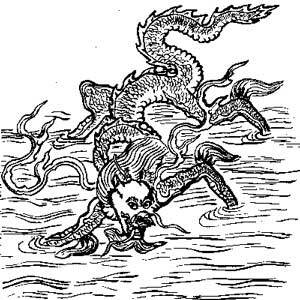 18887.151 潛龍 qianlong quotes the line from the Yi Jing, adding that as a result the term "submerged dragon" originally referred to an unrecognized sage. This is also a description of Zhuge Liang before Liu Bei came to meet him. The following compares the music of the present version (1589) with versions of 1579 (Ruilong Yin), 1590, 1609 (Canghai Longyin) and late Ming. Last section(s) of many versions write out repeats of earlier material; here 1589 says "同前三段續此 continue from/with Section 3", but then it writes out a new ending. Section 7 of 1609 also writes out the repeat (end of Section 2 plus all of Section 3), omitting the multi-note cluster ending, substituting instead a passage similar to last measure of Section 5 plus Section 6 of 1589. According to this, the 1589 version seems most closely related to 1609, in spite of the latter's added embellishments; the other three seem then to have drawn mainly on each other. See further comments on music. (1722; XIV/511) Cangjiang Yeyu; "蜀派 Shu school version"
(1751; XVI/106) 4; related to 1589 Shuilong Yin, but quite different. "as transmitted by 金陵吳官心 Wu Guanxin of Nanjing"
(1812; ?) Called only Long Yin but afterword says, "same as Canghai Long Yin"